Here is a collection of some of the best WordPress Gutenberg plugins to enhance the capabilities of the WordPress Gutenberg editor and help you create content through it. The new Gutenberg editor introduces a new way to edit content through WordPress. The block based editing system is faster, efficient and has more scope for enhancements. Therefore, even before the release of WordPress Gutenberg, multiple plugins have surfaced that enhances the Gutenberg editors features. Most of these plugins add more capabilities to the existing blocks, or add new, advanced blocks. Some of them also let you manage the blocks and their default behavior. All these plugins are available at wordpress.org plugin repository, and are free. They all work over the WordPress Gutenberg plugin we are about to discuss next. This plugin comes with some beautiful blocks that you can use to create attractive content. The blocks come with some advanced feature added to the basic blocks. For example: The basic text block is enhanced to change the text and background color. The cover image block lets you change the overlay color. Similarly, there are different blocks that you can use to create attractive and customized content. There are also a block for social media icons. This makes it possible to include social sharing options right within the content. What more, these Gutenberg add-ons are free to download and use. It is lightweight and integrates seamlessly into your WordPress website. Gutenberg is scheduled to release later this year. But just so that the WordPress community gets the time to get familiar with the new editor, the WordPress Gutenberg editor is released as a plugin. So until the release of WordPress 5.0, anyone who wants to try the new editor can easily do so. You can download the WordPress Gutenberg editor easily through the plugin repository at WordPress.org. This one is the main Gutenberg plugin, that includes the Gutenberg editor into your WordPress website. Once you install this plugin and activate it, you will be shown a new option to edit your pages through the Gutenberg editor. All the other plugins listed here will work over this Gutenberg plugin. Once the WordPress Gutenberg is released, the Gutenberg editor will replace the existing editor and you won't need to install this plugin anymore. But until WordPress 5.0 is released with Gutenberg editor pre-included, you can install this plugin and try the editor for yourself. All the Gutenberg plugins listed hereafter, work as addons for this plugin. If you want more blocks for your Gutenberg based page building, one of the best set is available with this plugin. Currently, there are over 20 blocks with some beautiful concepts like the Contact Form 7 styler, Marketing button for attractive CTAs, Content timeline, icon lists, blockquote for tweetable text, etc. The designs are pixel perfect and the blocks are customized for efficient performance. This is a free plugin, and you can download it from the WordPress.org plugin store. WooCommerce is one of the best plugins for integrating eCommerce features into your WordPress website. The new Gutenberg editor to let you create amazing content, with multimedia and text. Now what if you want to include a block with product details. This plugin, called Wootenberg lets you do that. The plugin adds a new block that lets you easily feature a product through your page/post. This plugin lets you feature a single product or a group of related products by applying the relevant filter. You can filter the products based on categories, sales statistics. Alternately, you can also display a group of totally unrelated products by choosing them individually. You can choose the order in which the products will appear. A product block created with the Gutenberg block will typically display the product image with the product name below it, it's price and a functional "Add to cart" button. This plugin comes with sample data that will give you a better idea of how your product block will look and what you can accomplish with the available options. Gutenberg editor is a block-based editor. For different sort of content, you can use different blocks. The WordPress Gutenberg plugin created by the team Gutenberg already comes with all the basic blocks. With these inbuilt blocks, you can create multimedia-rich beautiful pages and posts for your website. However, more Gutenberg blocks surely mean more possibilities. These blocks enhance your editing experience by providing more block options. There are several very important blocks like the inline notice block, Call-to-action block, author profile block, share icon block, etc. These blocks will let you create more intuitive content easily. For instance: If you need to display author details at the end of a custom post/page, all you need is an author block. Or if you need a call to action section to make the users act instantly, you have the call to action block. The best block I found is the container block, that lets you combine different blocks into one to create a custom content section. There are several other blocks that you can use to create and publish content using the additional atomic blocks. There are blocks for, post grid block, to show a gird of the posts published on your site, a testimonial block to show the user testimonials, a button block to let you create custom buttons, an accordion block, a spacer and divider block, a drop cap block, etc. As the name suggests, this is the block that you can use if you want to insert a map into your content. Like the one we studied earlier, the map block plugin does just one thing it is designed for. There are no multiple setting options, no different block options. You can install this block, activate it and start using the map block. This will let you show a google map into your post or page. The map inserted can be set for a particular address or co-ordinates. You can set the API key for your maps and you are ready to display maps on different parts of your site. The map created using this plugin lets you zoom in and zoom out on your maps. You can also set the height of the maps to adjust your content. This Gutenberg addon lets you manage where and how the Gutenberg editor is active. This plugin also lets you disable the Gutenberg editor for posts, pages, or certain post types. This plugin helps you a lot if you want to use some page building plugin like Elementor or the beaver builder to create pages. Here, you would want to turn off the Gutenberg editor. This plugin, the Gutenberg manager also lets you disable certain blocks of your editor if you don't want to use them. Besides, you can also choose to disable the Gutenberg editor for certain users. The plugin is innovative and will be of great use in future when the Gutenberg editor will be introduced as the default WordPress editor. In future, the team is also planning to introduce some additional blocks, that you can use along with the default Gutenberg blocks. The Advanced Gutenberg block plugin is a little more than just some additional blocks. In fact, it is a bundle of some advanced Gutenberg block, plus, some essential management options. 1) Additional blocks: There are some beautiful, customizable and efficient Gutenberg blocks like post links, message box to show notice, warnings, info, etc. and many others. 2) The Deactivation settings: If there are any Gutenberg blocks that you don't need in your website, you can deactivate them. In short, you can manage your blocks activation status from here. 3) Settings: This page lets you manage the settings of all your blocks. 4) Extensions: You can create your own new block and register it through this feature. This Advanced Gutenberg plugin adds many more features into your default Gutenberg editor. There are two WooCommerce product related blocks to show products with the add to cart feature. Besides, there are some blocks that can help you flawlessly display advertisements on your site using the blocks. It also includes a map block to display Google maps. The advanced Gutenberg is designed to add advanced features to the existing Gutenberg editor. The plugin comes with extra features and additional features for the existing blocks. This plugin can be used if you want to create advanced buttons. The button options include setting hover effects, padding, and borders. it also includes a map block to let you add Google map into your page or post. The maps can have zoom effects, icon, etc. There is also a counter block to attract more user action. Moreover there are blocks to create tabbed content and show accordions. Besides there are blocks for advanced image and videos through your Gutenberg editor. There is also a block for social sharing icons. The advanced Gutenberg plugin will surely change your editing experience. What is worth appreciation, is the updation and enhancement of the features of the existing Gutenberg blocks. Also, the additional blocks are useful too. Stackable adds about 17 new blocks to the WordPress Gutenberg editor. These blocks help you design your pages more efficiently. This WordPress Gutenberg plugin add some enhancements to the existing blocks, or add some new blocks. With the card based design being popular, the card block available with the Stackable Gutenberg plugin lets you showcase your page section with the card. There is also a block to create customizable pricing table with the text, button and prices. To create attractive pages with headers, there is this header block. You can add image, show text on it and also include one button for call to action. One of the best block is the video popup to show video that will pop up full screen on click. Stackable plugin has many important Gutenberg blocks like the testimonials, call to action, advanced blockquote, notifications, advanced button, spacer divider and the show more block. Also, one of my favorite blocks is the team block, that lets you include a section to introduce your team, with social media icon for each member. Moreover, this advanced Gutenberg plugin comes with accessible settings to manage the behaviour of your Gutenberg blocks. This is a simple Gutenberg plugin that adds a single block to the new Gutenberg editor. This plugin adds a block to show features/services to your WordPress page/posts. This is a lightweight and simple plugin that lets you highlight features/services easily. right now, there is no direct way to create a feature or service content section through Gutenberg editor. You can use different blocks to create it. But with the feature block, you can easily start highlighting the features you wish to. The Gutenberg editor has not made everyone happy. Despite of the fact that it brings about an evolution to the WordPress editing, some WordPress users would still like to use the existing Gutenberg editor. The disable Gutenberg plugin is for those who utterly love the Classic editor, or not yet ready to switch to the new Gutenberg editor. This is the Gutenberg plugin to disable the Gutenberg editor. This is a lightweight plugin, with a simple idea. It lets you disable the Gutenberg editor and switch to the TinyMCE editor instead. You can choose to completely disable the entire plugin, or disable it for particular users or post types. Do you wish to include a predefined format for the Gutenberg editor opened for a specific post type. You can go to the admin page of this Gutenberg custom fields plugin, and choose to add a new template. You can choose the post type, and add the fields you want to set. Save it and the next time you try to add new post for that post type, the saved template will appear. Therefore, you can configure your Gutenberg editor to show up with certain fixed fields. This plugin works well for the blog sites that follow a fixed format of posts. Or fixed format for different post types. 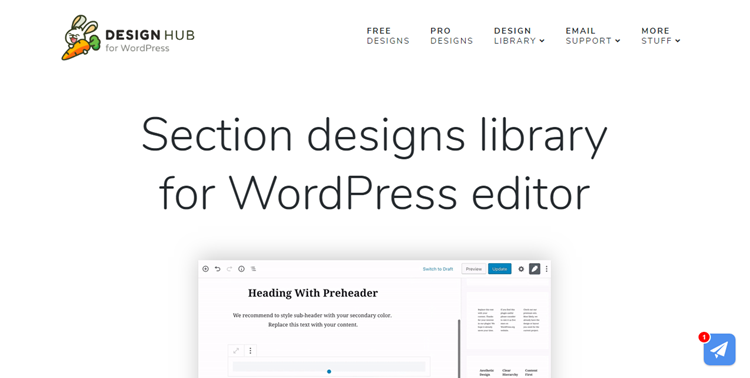 The WP design hub is a growing library of Gutenberg blocks and templates. It makes creating attractive designs so easy. They have some free blocks with great design, while there are designs that are available as WP Design hub pro package, paid designs. What is your favorite WordPress Gutenberg addon? The new Gutenberg editor actually provides a better way to create and publish content. And all these plugins, enhance the capabilities of the block based editor, by providing extra blocks. You can head on and check the plugin page to see what new each plugin has to offer. All these plugins are updated frequently, and new innovative blocks are added for affective content creation. Tell us which WordPress Gutenberg plugin you liked the most or if you have used one, do let us know how you felt about it. Also read: The best WordPress Gutenberg themes to start your new website.